Bridge County Bluegrass Band photos. Photos from our shows across Ohio, Michigan, and the Midwest. 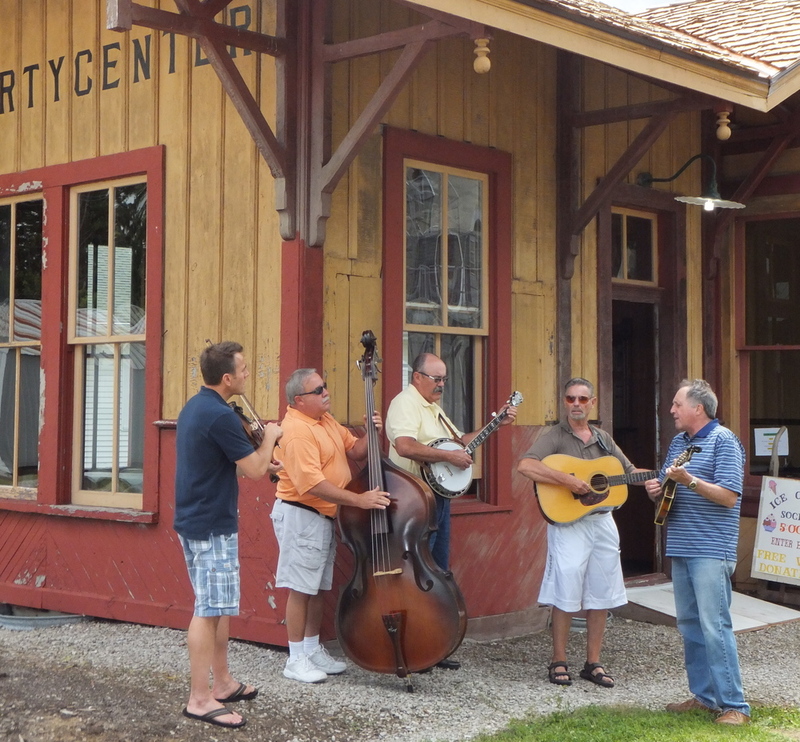 Top: Bridge County Bluegrass Band performing at the Liberty Center, OH Ice Cream Social at the Historic Train Depot on June 21st, 2015. Bottom: Our new sound engineer, Aidan, did a great job making us sound good. Bridge County Bluegrass Band posing for a quick picture after our November 14th, 2014 show at the Lake Township Hall in Millbury, OH. Hot music on a cold November night. Bridge County Bluegrass performing at the Huron Valley Eagles in Flat Rock, MI on October 4th, 2014. Bridge County Bluegrass Band performing at GlennPark Assisted Living Mayberry Day Celebration in Defiance, Ohio on August 30th, 2014. 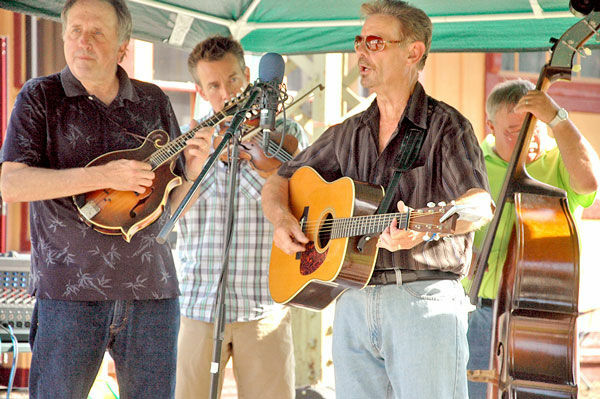 Bridge County Bluegrass Band performing at the Blissfield, MI Bluegrass on the River Festival on August 23rd, 2014. 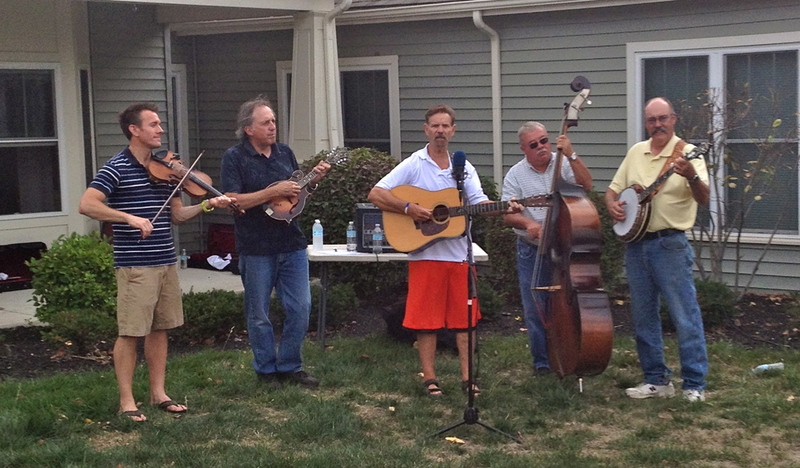 Bridge County Bluegrass Band performing at Saint Clair Shores, MI Country Music Festival on August 2nd, 2014. Thanks to all of our loyal fans and friends who drove to this Detroit suburb to hear us play. You can't see Lake St. Clair in this photo, but trust us...Veteran's Memorial Park was a great spot for bluegrass music. Bridge County Bluegrass Band performing for the Music in the Park Summer Concert Series at Lake Township Ohio Friendship Park on June 27th, 2014. It was a perfect evening for outdoor bluegrass music and grilling. Thanks to all of our friends, old and new, who came out to listen to the show! Bridge County Bluegrass Band performing at the Armed Forces Day Rockin' Bluegrass Festival in Port Clinton, Ohio on May 17th, 2014. The weather was a little cool and we dodged some rain drops but we sure had a great time performing for an appreciative crowd. Bridge County Bluegrass Band performing at the Glenn Park Assisted Living Mayberry Day Celebration in Defiance, Ohio on August 17, 2013. Yes, that is Barney Fife's police car behind us. Bridge County Bluegrass Band performing at Lake Township's Friendship Park for the Music in the Park concert series on July 19, 2013. Bridge County Bluegrass Band performing at the Woodville, Ohio Independence Day Celebration on July 4th, 2013. Bluegrass music under the bigtop...how much more American can you get? Bridge County Bluegrass Band at the Liberty Center, Ohio Founder's Day Celebration. Bridge County Bluegrass Band performing at the Ayersville, Ohio Methodist Church Summer Celebration and BBQ on June 23rd, 2013. Life doesn't get much better - great food, cold drinks, fun people, and homemade ice-cream. Summer is here! Bridge County Bluegrass Band performing for the Toledo Day Nursery Old Orchard Garden Tour on June 15, 2013. The yearly Garden Tour is a benefit to for the Toledo Day Nursery.